The Medline Bariatric Rollator Walker features a durable steel frame and large 8" wheels with reinforced forks and spokes allowing wheels to easily roll on all surfaces. This heavy-duty rolling walker has height adjustable handles and greater distance between the handles (23.5”) for people that need or want the extra room. 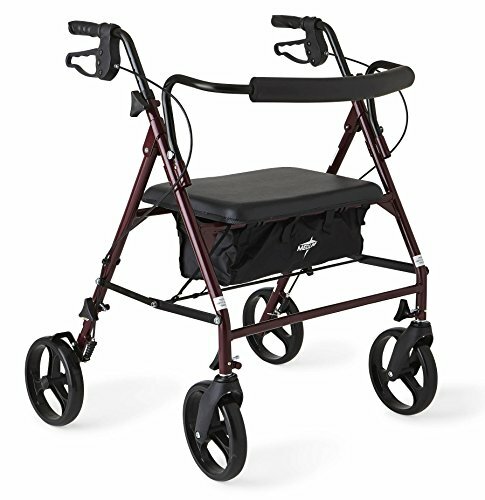 Built for comfort, the walker has a padded seat and back support, so you can sit and rest in comfort after walking. This item also comes with loop brakes that allow you to stop safely, and the foldable design makes it easy to store away when not in use. NOTE: This rollator is 29" wide and may not fit through standard door frames found in the home. Product weight: 25 pounds.